I used to be scared of the ocean. There’s something about the big blue that is utterly paralysing – whether it be the vast open space that plunges into never-ending darkness, or the claustrophobia that comes with having all that water pushing down on top of you, not to mention knowing that there’s a forest of spiky coral just inches from your skin. Mexico’s Riviera Maya changed all that for me though; it made me more confident in the water and aware of its incredible offerings. It also opened up my eyes to beauty on land too. This unusual tourism hub is like no other resort district I’ve encountered. It’s a land composed of fragile marine life, rich Mayan history and undulating landscapes, peppered with ancient ruins and dusty roads, fusing together to create a heady hodgepodge of culture and nature. 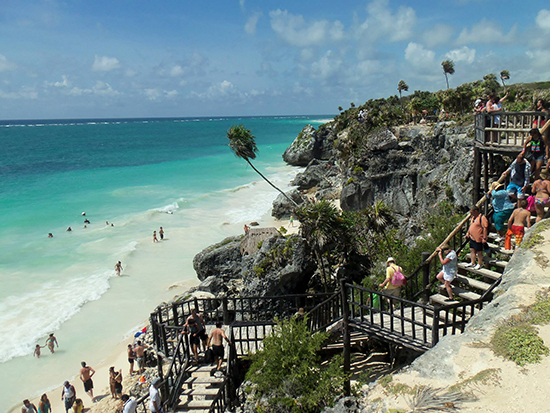 Riviera Maya is lauded as a beach-lover’s paradise. Its white sands are just itching to be bathed upon, cocktail in hand, lulled by the sounds of a gentle sea breeze. But its underappreciated underwater offering is the real A-lister. From some hotels, all you need do is peel yourself off the sun lounger for a refreshing paddle and you’ll be met by majestic green and loggerhead turtles (best spotted at Akumal Beach), not to mention the striped sergeant major (that fish that resembles a bumblebee), abundant butterfly fish, lightning-fast barracuda and coral-munching parrotfish – to name a few. We decided to venture deeper for this trip though: two hours off the coast of Spring Break capital Cancun. We were in search of a fish much greater than the small fry that frequents the shallows; a beast so big and beautiful that you feel ant-like in comparison. 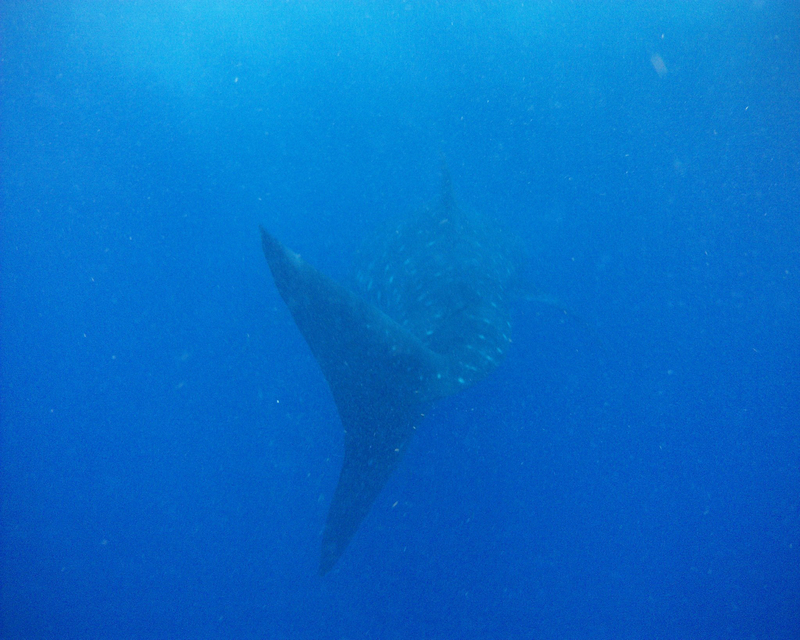 I’m talking about the world’s largest fish, the whale shark. 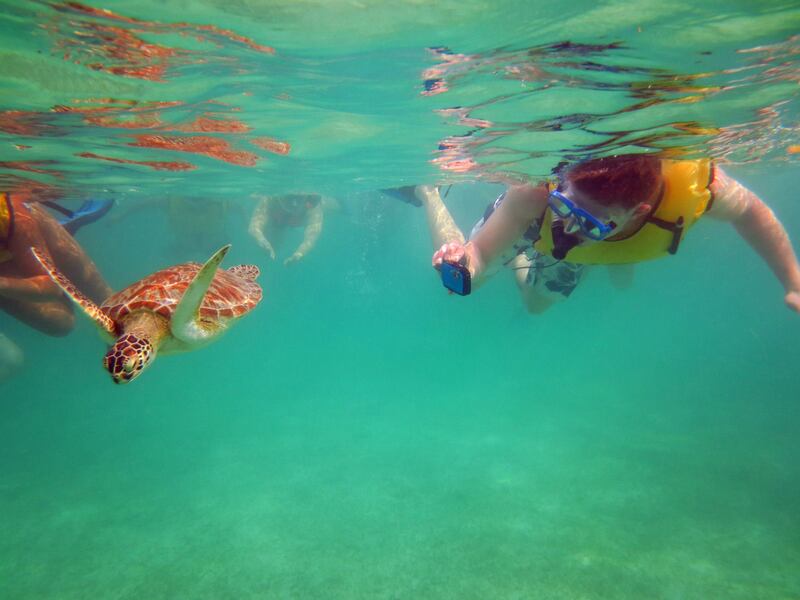 And that day, we saw – and swam with – three. The Yucatan Peninsula sees the largest summer migration of whale sharks in the world – as many as 1,400 swim through the Gulf’s warm Caribbean waters every May-September. A handful of us took it in turns to don flippers, masks and snorkels, jumping into the water whenever one passed. They were massive. Their sheer size was beyond comprehension, but these 12-metre mammoths were oddly graceful too, their fins cutting through the current with ease as they casually enjoyed their plankton lunch. Despite the school of manta rays beneath my feet and the darkness that lurked even further below, my fear was gone. With such magnificent creatures around, how could it not be? 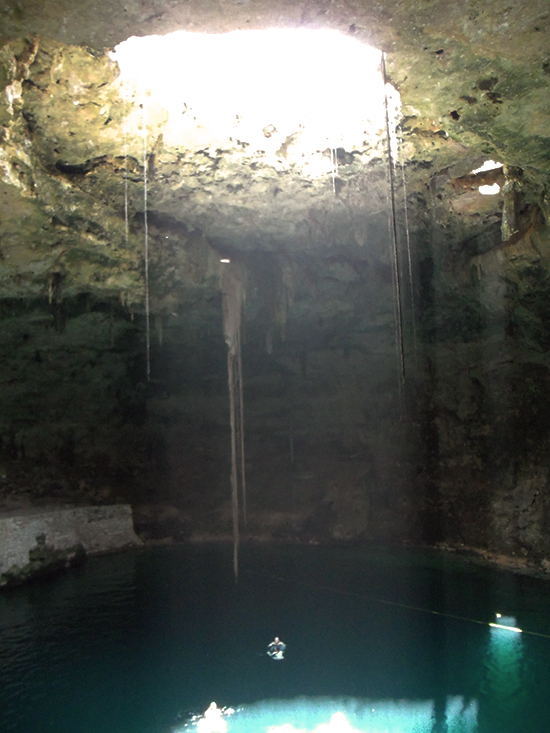 Not all of Riviera Maya’s watery excitement happens at sea: cenotes are case in point. There are around 7,000 of these water-filled sinkholes across the Yucatan Peninsula – of which less than 2,500 are registered for public use. Most are filled with natural pools, garra rufa fish (of pedicure fame) and stalactites and stalagmites of varying size, not to mention being ripe for a bracingly cold swim. Some of the best, and in turn most famous, include Dos Ojos, south of shopping hub Playa del Carmen, the Gran Cenote near Tulum, and Ik Kil, a popular stop-off en route to Chichen Itza. For those seeking a more controlled environment there’s also aquatic parks like Xel-Ha and Xcarat, both of which have cenotes along with other rides and zip-lines. On our trip we opted for Ik Kil, a dark yet breathtaking cavern, filled with catfish below, birds in the entrance hole high above and vines hanging in-between. The water was icy cold – not for the faint hearted – but a welcome reprieve from the searing heat. The surrounds were beautiful too, an ancient cave formed by Mother Nature herself. It doesn’t get much more memorable. 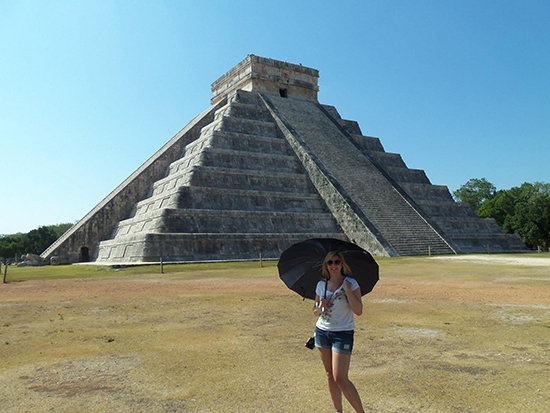 Mexico’s Mayan history is just begging to be discovered through its innumerable archaeological sites – the most famous being the pre-Colombian city of Chichen Itza and its world-renowned centrepiece, El Castillo. It’s a four-hour drive from most Riviera Maya resorts to this UNESCO-listed site, so we boarded a coach at 5am – a disturbing time that neither I, nor my partner, were particularly familiar with. It was worth it to arrive at 9am though, beating the majority of the crowds who rocked up at 11am. Until then we had the World Wonder largely to ourselves and also managed to avoid the scorching midday sun, as well as the many pressure sellers who set up shop mid-morning. Coastal Tulum is good at time travel too. As you walk meandering pathways, amid ruins overgrown with flora and fauna, you can imagine how the Mayans must’ve felt when a storm hit, hiding in their fortress, and also when the sun shone at its brightest, looking over spectacular beaches and clear turquoise blue waters. This iconic archaeological site is about more than its teetering cliff-top ruins though and is also an important nesting site for turtles, not to mention home to what is undeniably one of the best beaches in the world. 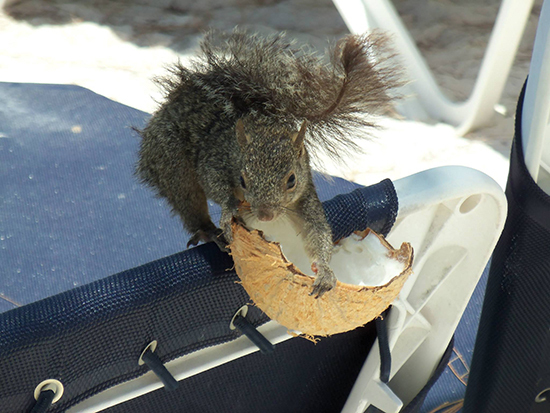 Squirrels and iguanas roam the sands here too, not to mention on pretty much every beach Riviera Maya has to offer. 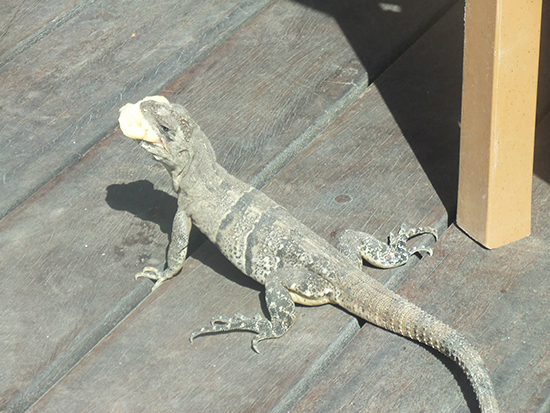 Be wary with food around the latter; we saw one unsuspecting tourist at Tulum get chased for her banana. Move over Old El Paso: this is the real deal. Mexico not only changed my attitude to water, it turned me into a bit of a food snob too. Of course taste burritos and tacos, but make sure you try tamales, panuchos, quesadillas and proper fajitas too – complete with meat, veg, fresh salsa, guacamole and big dollop of tasty refried beans. It’s utter bliss and will change the way you taste Mexican grub back home. If you take anything away from this article, let it be this: British tinned refried beans are the devil’s work and they ain't got nothing on the real thing.